Researchers at the Thomas Edison National Historical Park have discovered that 17 unlabeled wax cylinder phonograph records found stashed in a cabinet behind Edison’s cot back in 1957 contain extremely rare recordings made in Europe in 1889 and 1890, including the only known recording of Otto von Bismarck, first Chancellor of the German Empire. Two [of the wax cylinders] preserve the voice of Helmuth von Moltke, a venerable German military strategist, reciting lines from Shakespeare and from Goethe’s “Faust” into a phonograph horn. (Moltke was 89 when he made the recordings — the only ones known to survive from someone born as early as 1800.) Other records found in the collection hold musical treasures — lieder and rhapsodies performed by German and Hungarian singers and pianists at the apex of the Romantic era, including what is thought to be the first recording of a work by Chopin. Since they weren’t labeled or cataloged, nobody had any idea what was on them until last year when Edison laboratory curator Jerry Fabris used an Archeophone device to trace the grooves on 12 of the cylinders and convert them to audible wav files. The recordings were very faint, too faint for Fabris to identify, so he enlisted the aid of sound historians Patrick Feaster of Indiana University and Stephan Puille of the University of Applied Sciences in Berlin to try to determine who and what were on the cylinders. They had a starting point: the words “Wangemann. Edison” carved into the lid of the wooden container in which the cylinders had been found. Adelbert Theodor Edward Wangemann had been hired by Edison in 1888 to market his newly invented wax cylinder phonograph. Wangemann quickly became adept at recording with the phonograph and was sent to Europe in June of 1889 to supervise the operation of the Edison phonographs on exhibit at the Paris World’s Fair. The assignment was only supposed to last two weeks, but after the World’s Fair was over Edison expanded his brief and allowed him to travel Europe collecting quality recordings to use for exhibitions. After Paris he went to his native country of Germany where he set up displays of the technology for scientists and luminaries. In Berlin, Wangemann set up his equipment in a room loaned to him by the Siemens Corporation. 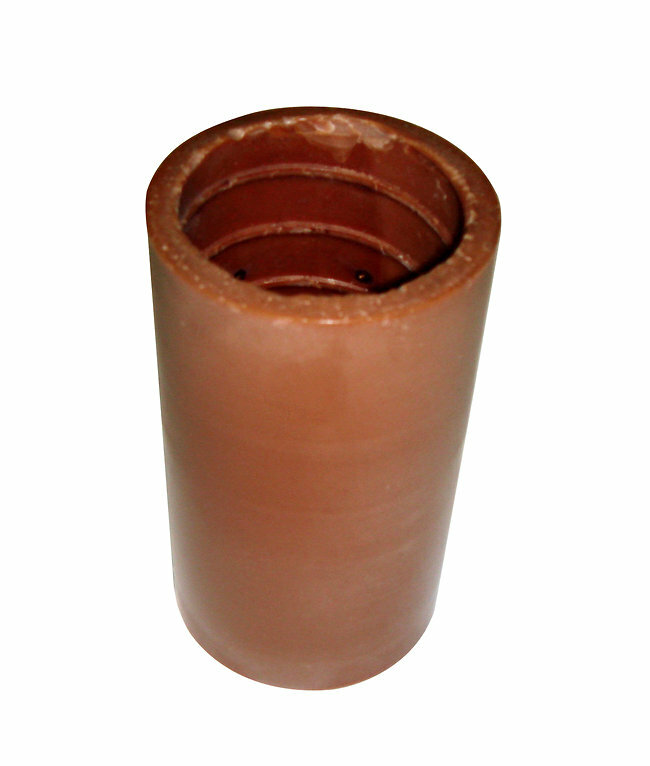 He carried the cylinders and accessories to the exhibition room in a lockable wooden box. It’s that box that was discovered back at Edison’s New Jersey lab in 1957. Edison joined Wangemann in Germany to make a splash during the phonograph exhibits to scientists. While he was there, Edison asked to meet the three most important people in Germany, Bismarck, von Moltke and Kaiser Wilhelm II, but none of them were available. 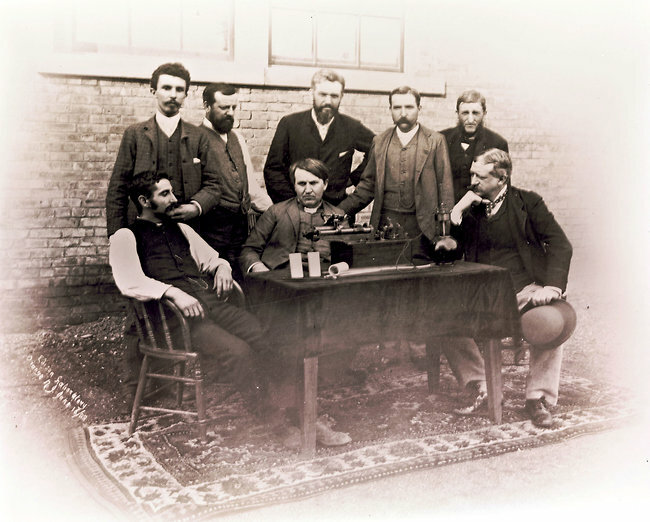 They all replied that they wanted to see the phonograph, though, so Edison sent Wangemann to show them the new toy and get their voices recorded for posterity. He did meet with them all, but although Wilhelm II greatly enjoyed Wangemann’s musical recordings, he never did get his own voice carved in wax. Three of his sons, the eldest just seven years old, did get recorded. 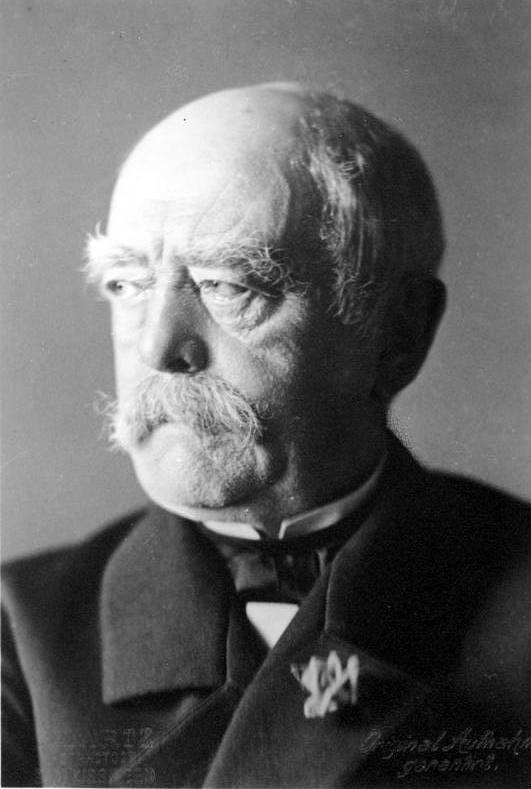 In Friedrichsruh on Oct. 7, 1889, Wangemann recorded Chancellor Otto von Bismarck reciting verses from several ditties in four languages. The first is “In Good Old Colony Times,” a British folk song that was altered after the American Revolution to give it an anti-monarchist spin. The second is “Als Kaiser Rotbart lobesam” (When good Emperor Redbeard), an 1814 German heroic ballad by Ludwig Uhland about Emperor Frederick I Barbarossa going on the Third Crusade. The third is the Latin song “Gaudeamus igitur,” a popular graduation song in Europe at the time with your classic “carpe diem” message. The fourth is the first verse of “La Marseillaise,” which is something of an enormous iceburn on the French given their ignominious defeat by Bismarck’s Prussia in the Franco-Prussian War of 1870–71. The last lines Bismarck speaks are a direct appeal to his son Herbert who would listen to it on a phonograph in Budapest a few weeks later and recognize his father’s voice. 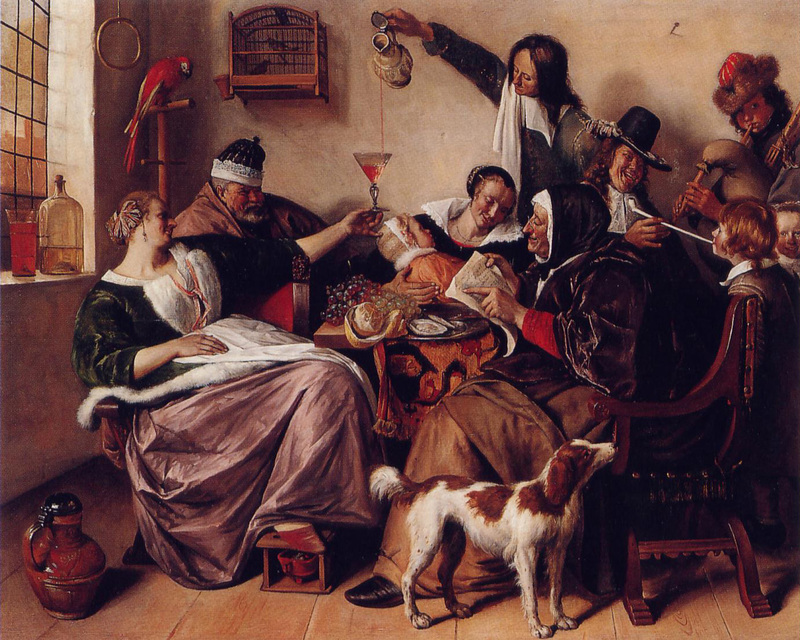 “Do everything in moderation and morality, namely work, but then also eating, and apart from that especially drinking. Advice of a father to his son.” Solid Junker advice, that. 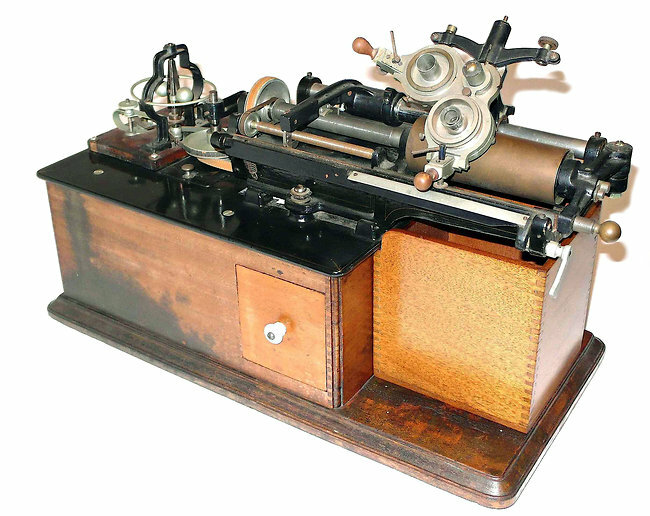 Read about all of the newly converted Edison/Wangemann wax cylinders, listen to the recordings and read the original text and transcripts of the spoken parts on the National Park Service website. 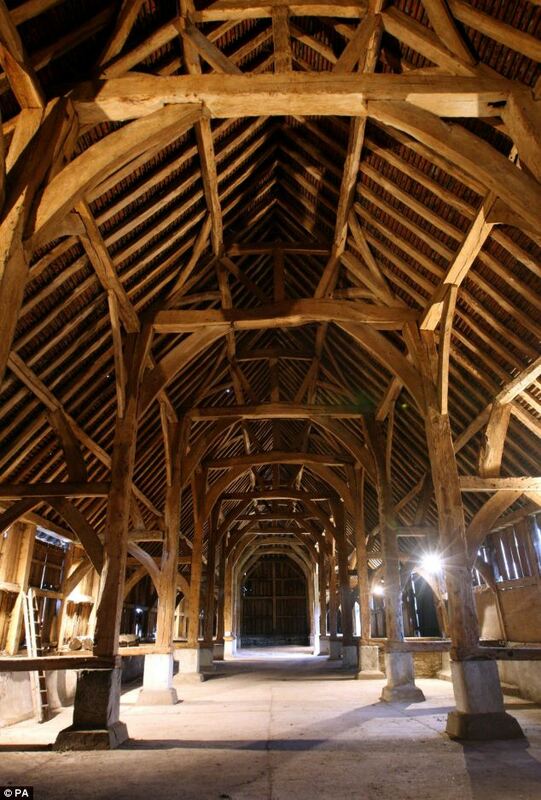 Harmondsworth Great Barn was built in the village of Harmondsworth, Middlesex in 1426 to store grain harvested from the Winchester College manor lands. 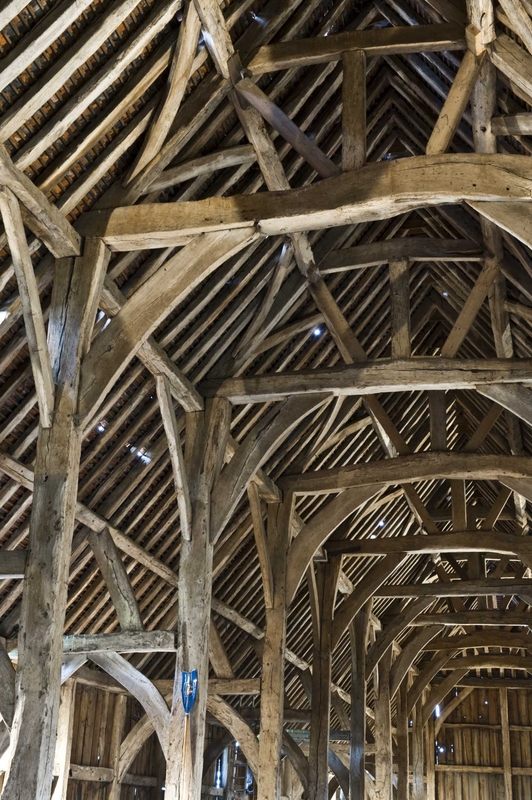 The barn is 192 feet long, 39 feet wide and 36 feet high making it the largest timber-framed building in England, and fully 98% of the oak timbers are original. 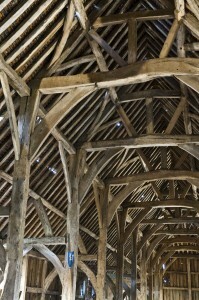 The twelve interior bays are made from 13 massive oak posts resting on stone piers. Winchester College records from 1426 indicate that master carpenter William Kypping (or Kipping) got these mighty oaks in nearby Kingston upon Thames, and dendrochronological analysis (tree ring counting and pattern matching) confirms that those oaks that still hold the hipped tiled roof up today were felled in the early 15th century. 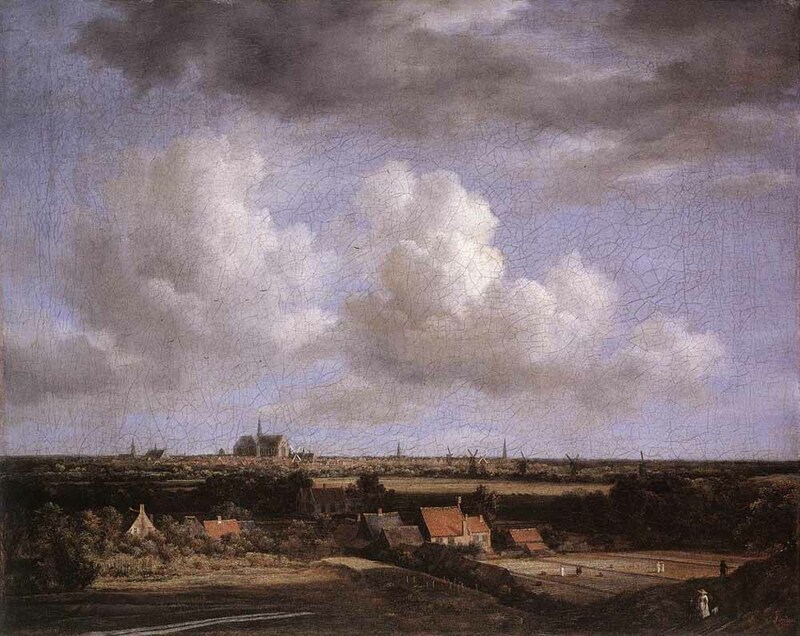 The building used to be even bigger, but a north wing was demolished in 1774. It had a close encounter with a German bomb during World War II, but survived with just a few roof tiles askew. The barn was granted Grade I listed building status — the same grade as Buckingham Palace and the Houses of Parliament — in 1950, and then designated a Scheduled Ancient Monument on top of that. It continued to be used for agricultural purposes until the 1970s when the encroaching sprawl of London made it the only Medieval barn in the area to survive its absorption into the west London suburbs. In 1986, the barn was purchased by property developers the John Wiltshier Group who planned a full restoration. 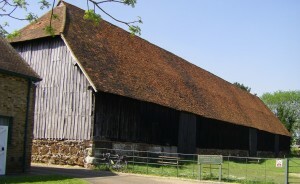 When the John Wiltshier Group went into receivership in 2006, the receiver offered the barn to the National Trust, English Heritage and Hillingdon Council for a token £1, but amazingly all three declined to purchase, probably intimidated by the daunting process of dealing with a Scheduled Ancient Monument (every change, even necessary repairs to a leaking roof, say, requires a literal act of Parliament) and the large sums of money they’ve had to spend every year to maintain such venerable carpentry. Instead, in 2006 a shady anonymous offshore trust registered in Gibraltar and named Harmondsworth Barn Ltd. purchased the barn for £1 and proceeded to do nothing at all to it. They let it rot and closed it to the public except for one open weekend a year. English Heritage wrote them increasingly concerned letters about the condition of the barn, even going so far as to offer them grants to help fund necessary repairs. Harmondsworth Barn Ltd. didn’t respond. It seems their sole interest in the property was how a proposed expansion of Heathrow Airport would bring a new runway just yards away from the barn. If the Heathrow build had gone through and the barn had been damaged or demolished, then the owners would have been due compensation. The airport expansion plans were abandoned. Obviously the “investors” didn’t exactly spend big money to buy the property and they certainly had no interest in spending the tens of thousands of pounds a year required just to keep a 15th century barn from falling apart. Finally last year English Heritage got the barn delisted as a Scheduled Ancient Monument smoothing the way for them to step in and save the day. Those dirty offshore rats actually had the testes to protest the delisting because they preferred to keep their £1 investment in a state of increasing decay. English Heritage immediately spent £30,000 on emergency repairs, primarily to the roof which had holes in it from slipped and broken tiles. They also did some repair work to the weatherboard siding, most of which is also original, a very rare thing for barn siding. Once the worst holes were plugged, EH took Harmondsworth Barn Ltd. to court to recover the public moneys they were forced to spend. Again the offshore corporation protested and rejected any attempts to settle out of court. Almost a year later, a settlement has been reached: English Heritage pays £20,000 to Harmondsworth Barn Ltd. and becomes the new owner. 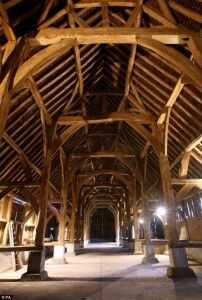 Last week, English Heritage, which sees the purchase of the Great Barn as a welcome victory after a long series of drastic cuts in its budget, told the Independent that the building is “a supreme example of late-medieval craftsmanship – a masterpiece of carpentry containing one of the best and most intact interiors of its age and type in all of Europe”. 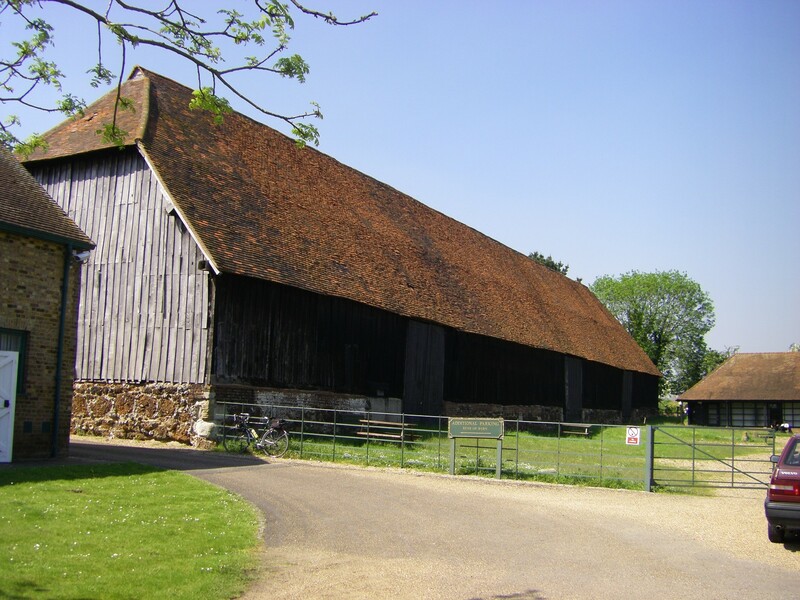 English Heritage will be handing over the running of Harmondsworth’s Great Barn to members of local campaign group The Friends of the Great Barn at Harmondsworth. It is expected to be open to the public from this April. I can’t help but resent that those land speculator groinpulls managed to convert their single pound into 20,000 despite their shameless and deliberate neglect of the place. I bet English Heritage wishes they’d fished through their couch cushions for that pound back in 2006. The Island of Montecristo, most famous for its role as the treasure island in Alexandre Dumas’ novel of betrayal and revenge (the best adventure story ever written, in my humble opinion), is a protected nature reserve in Arcipelago Toscano National Park, a chain of islands between the coast of Tuscany and the Island of Corsica. Giglio, the site of the ongoing Costa Concordia grounding disaster, is another island in the archipelago just east of Montecristo. The islet is the tiny, rugged tip of an underwater volcano, and the only humans living there are one official caretaker and his family. Sights include an 18th century villa and the ruins of a 7th century A.D. monastery dedicated to Saint Mamilian of Palermo, a 5th century bishop who slew a dragon on the island and changed its name from Montegiove (“Jupiter’s Mountain”) to Montecristo (“Christ’s Mountain”). Very few tourists get to see them, however, since the island can only be reached by private yacht and only 1000 travel permits a year are issued. Those few boats — and perhaps many others before them over the centuries — have carried an even more pernicious kind of tourist: the black rat. As they so often do, the rats have made a cozy home for themselves on Montecristo, breeding lustfully and invading every niche of the delicate islet ecosystem. There’s an estimated one rat per square meter. Italian and European government agencies are planning to solve this problem by nuking it from orbit. It’s the only way to be sure. Okay, not exactly, but the scheme is almost as cockamamie as that. The National Park, the region of Tuscany, the Italian Ministry of Agriculture and the European Union announced that starting at the end of January, they will fly airplanes over Montecristo and drop 26 tons of pesticide pellets to kill all the black rats. They plan to use brodifacoum, an anti-coagulant poison often used as a rodenticide which is classified as “extremely toxic” for its devastating effect on mammals, birds and fish. How do they plan to ensure none of the pellets miss the tiny tip of the volcano in the middle of an island chain national park, and having ensured this, how did they plan to ensure that only the invasive rats eat them instead of the native fauna? They have top men working on it right now. Top. Men. Director [of the national park authority] Franca Zanichelli defends the project. “Nobody wants to poison the island,” she explains. “The project, prepared by experts, involves the use of 26 tons of food pellets, similar to that used to contain the rats everywhere, consisting of edible cereal feed which inside holds a fraction of a percent of the active poison. The baits, which can not be placed off the ground to the inaccessibility of the rugged interior, will be distributed by air with a special funnel provided by another protected area in Sardinia that has already performed a similar operation. Rat exterminations were performed with similar success in smaller Giannutri [, the southernmost islet in the Tuscan Archipelago]. Ecological groups, anti-vivisection organizations and former world champion dive fisher Carlo Gasparri (a native of Elba, home of Napoleon’s first exile and the largest island in the archipelago) vocally oppose the plan and have requested a halt to the project pending an official government investigation. Gasparri believes rats should be eradicated using a less toxic product that doesn’t persist in the environment for years, accumulating in animal tissues, tainting the food chain for God knows how long. Fiorella Ceccacci Rubino, a representative from the ruling center-right People of Freedom party, has introduced a parliamentary inquiry on the merits of the plan, submitting that a less environmentally damaging method should be used. P.S. 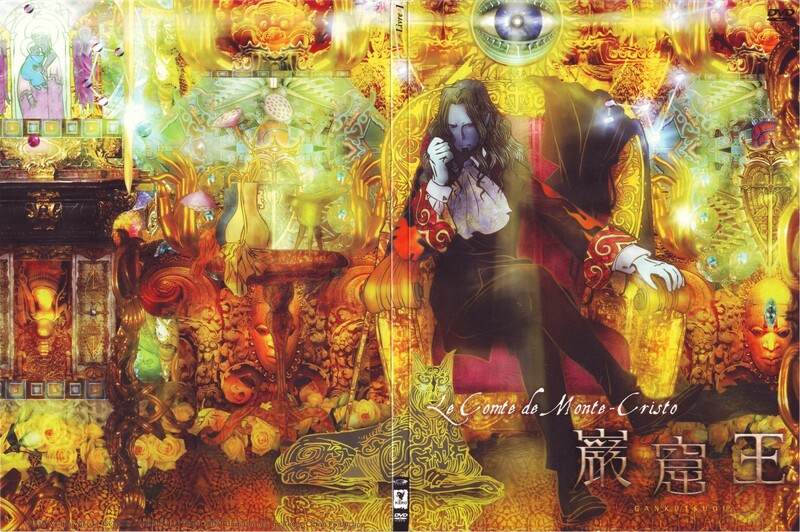 – The top picture is from the phenomenal anime science fiction version of Dumas’ immortal novel, Gankutsuou: The Count of Monte Cristo. Although there are of course a number of major departures from the original, this is the only filmed version of the book I’ve ever seen that does the novel justice. If you love the book, like me, and if like me you’ve seen every live action movie version only to be disappointed, even renting the late 1990s French mini-series hoping that at least Dumas’ countrymen would respect the genius of his plot, pacing, and characterization only to stare in undisguised horror at Gerard Depardieu playing the starved and driven-to-madness Edmond Dantès in the Chateau d’If pretty much like he played Obelix, then Gankutsuou can make you whole again. 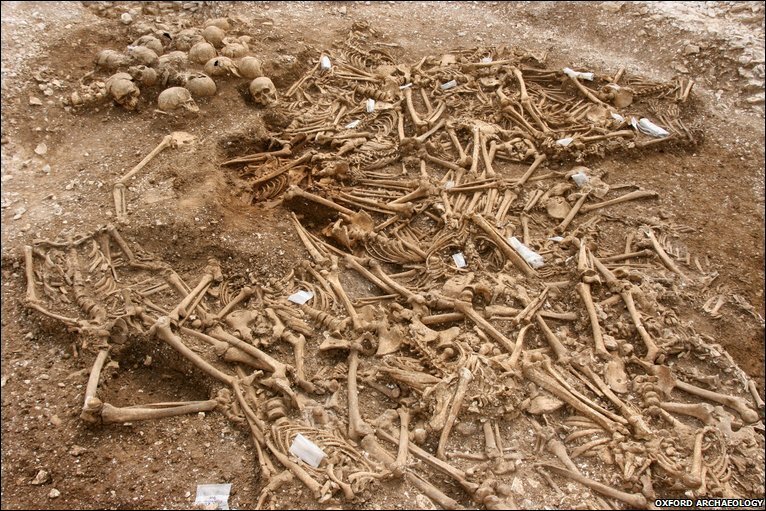 In March of 2010, scientists confirmed that the 54 decapitated bodies unearthed in Dorset a year previously were Vikings. 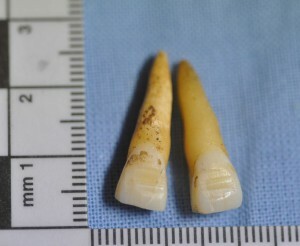 Isotope analysis on their teeth proved that they had grown up in Scandinavia, one of them in the Arctic circle, no less. The theory researchers were working from at the time was that the deceased were members of a Viking raiding party who had been decapitated by Saxon defenders. University of Cambridge researcher Dr. Britt Baillie has a new theory on who they might have been. Based on further analysis of the bones and on documentary research, Dr. Baillie posits that these Vikings were an elite force of mercenaries executed not by Saxons, but by other Viking mercenaries, perhaps even at the behest of English King Aethelred the Unready. Mass executions from the medieval period are not common finds, and there have been several other discovered from Aethelred’s reign. Aethelred had been paying tribute (the Danegeld) to Danish kings since they defeated his forces at the Battle of Maldon in 991. The Viking raids didn’t stop, though, and by 1002, Aethelred was sick of it. According to the Anglo-Saxon Chronicle, the king’s councilors told him the Danes would kill them all and steal his kingdom so he ordered all Danes in England be slain on St. Brice’s Day, November 13, 1002. The St. Brice’s Day Massacre, as it would become known, saw Anglo-Saxon mobs tear through their communities, killing Danish settlers. The Dorset mass grave, however, was not the work of a mob. It was a deliberate execution and decapitation only of men of fighting age, and most interestingly for Dr. Baillie, these men weren’t decapitated by a blade to the back of the neck. They were decapitated from the front, just like the captured warriors in the Saga of the Jomsvikings, an Icelandic saga about a quasi-legendary fighting force of Viking mercenaries who were reputedly the fiercest of all Viking warriors. “The legends and stories of the Jomsvikings travelled around the medieval world and would almost certainly have been indicative of some of the practices of other bands of mercenaries or may even have been imitated by other groups,” Baillie said. One of the victims had filed teeth, a rare Scandinavian practice which might have been an indication of high status or a way to look extra scary while making a war face. So even if the Dorset Vikings weren’t Jomsvikings, they may have been modelling themselves after them, and their executioners apparently respected that, hence the theory that they were Vikings as well. Since Aethelred was in the practice of pitting different bands of Danes against each other, even ones he had hired himself, that’s certainly plausible. The discovery of the grave and analyses of the human remains are documented in a National Geographic special that aired in the US in December. It was luridly titled Viking Apocalypse for the sensation of it, I suppose, but despite that and the tedious shouty reenactments, it was actually fairly science-heavy. Sadly there’s no video available on the website any more, but the show is still airing in the UK. You can catch it next on Sunday, January 29 at 7:00P.M. Here’s a short clip from the beginning of the show with some excellent footage of the mass grave. Naturally I watched the rest of her videos in quick succession. Then I secured a copy of “Ancient Roman Hairdressing: On (hair) pins and needles,” a paper she wrote that was published in the 2008 edition of the Journal of Roman Archaeology (JRA). The depth of her knowledge blew me away. She is fully conversant in the archaeology (including unpublished artifacts), ancient literary sources and published scholarship of Roman hairstyling, and not just Roman but Etruscan and Greek as well. Virtually all commentators demonstrate modern technological biases that lead to anachronistic speculation: in both looking at images and interpreting literary passages, they assume that the Romans used the same hairdressing technologies as do moderns. In addition, not being hairdressers, they fail to understand the technical possibilities of the tools that the Romans did have at their disposal. I will analyze the physical capabilities of the single prong hair-pin in order to show the impossibility of its application in many contexts. As an alternative I will propose sewing needles, arguing that, as Roman women of the 1st c. A.D. abandoned vitta-based [(vittae were linen or woollen ribbons used to tie the hair together when arranging it)] coiffures in favor of more elaborate fashions, they used needles (artifacts well attested in antiquity) invisibly to stitch together the style’s various components. And that’s just the second paragraph. The rest of the paper lives up to its promise and then some. 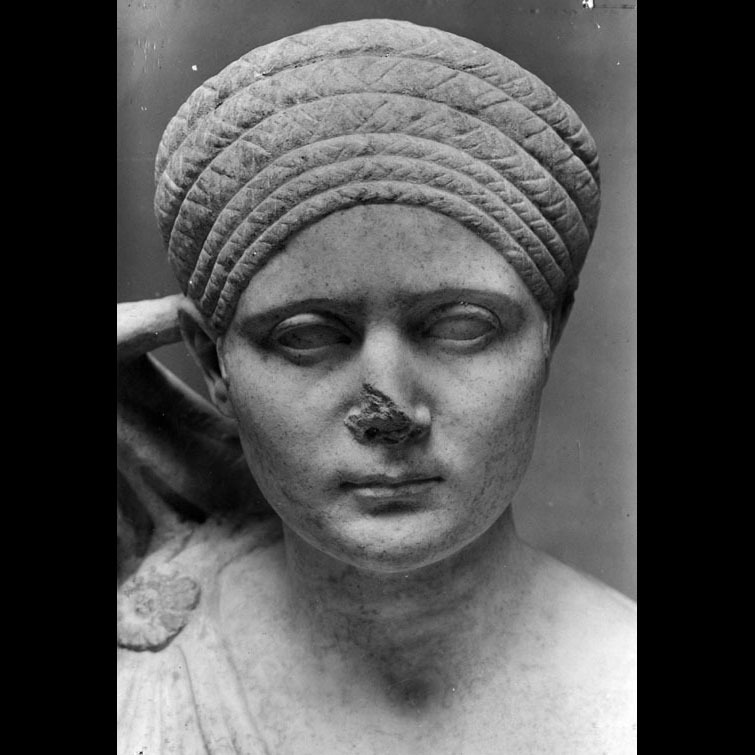 Her most recent video, Julia Domna: Forensic Hairdressing, a recreation of a later hairstyle of the hirsute empress, was presented to great acclaim at the Archaeological Institute of America’s Annual Meeting in Philadelphia earlier this month. Shocked and awed by her combination of scholarly research and styling craftsmanship, and cat-killingly curious about how all the elements came together, I asked Janet Stephens if she would submit to an interview and she has most graciously done so. Q: How did you first begin to research ancient hairdressing? A: My research began with a visit to the Walters Art Museum in 2001. They had just finished renovating the Greek/Roman collections and displayed a number of portrait busts at eye level, out in the center of the room, like a cocktail party. I had never seen the back of a roman portrait before—they are usually placed high on shelves/pedestal with the backs tight up against a wall. As I circled the portraits I saw the logic of the hairstyles and determined to try some at home. It was electrifying, can’t thank the Walters enough. Q: When was the first time you tried to recreate a look and how successful was that initial foray? A: I think it was my first day off after that visit! I pulled out a long haired mannikin to try out Julia Domna, type 2. I made it as far as the serpentine bun and hit a wall. Bobby pins and hair pins just wouldn’t do the job. It was all library leg work and practical experimentation after that. Q: Which came first: your love of history or your love of hair? A: My love of hair definitely came first (as a child I had the best coiffed dolls in the neighborhood), and my love of hair kindled my love of fashion and social history. Q: Your article in the JRA demonstrates an astonishingly thorough command of the archaeological record, and of primary and secondary sources relating to Roman hairstyling (and not just Roman, but also Etruscan and Greek). How did you master such a density of material? A: Lots and lots of reading, poring over exhibition catalogs, back searching the footnotes to the reading and reading some more! It helped that I am fluent in Italian and, in 2006, I took a German for reading class. Working in my spare time, the research took 6 years. Q: Did you do all this research on your own or through a school or other institution or …? A: I am an independent researcher, but my husband is a professor of Italian at the Johns Hopkins University, so I have library privileges there. We are friendly with colleagues in the Classics/Archaeology department and at the Walters Art Museum. They were kind enough to send me articles and clippings, read drafts and help with some picky Latin, though I try not to impose. Q: You say in the JRA article that sculptures tell you where to part the hair, what direction to twist it in, even whether the curl is natural or artificial. I’m particularly curious about the latter. How you can identify the source of the curl? A: It helps to have a lot of hairdressing experience! This is a complex topic with room for much ambiguity. Identifying artificial curl on a statue requires a visual literacy similar to that necessary to distinguish a particular painter’s work by his brush strokes. It can be difficult to identify artificial curl today because of the vast array of hair care technologies available. The Romans did not have the range of technologies that we do (electric dryers, plastics, cheap metal clips, air conditioning, hair spray), so changing the shape of hair was both risky (irons heated over fire) or time consuming (air drying wet hair so it takes on an unnatural shape can take many hours). How long these artificial curls might endure depended on climate and weather. I believe most Roman women made do with their natural curl patterns and avoided artificial curling. 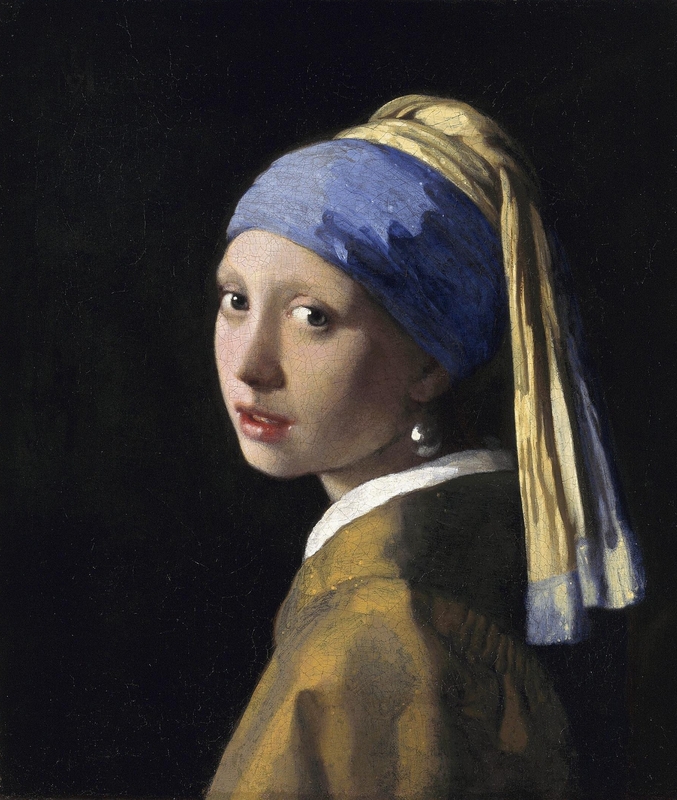 But on Roman portraits, curls that are too neat, ribbon-like, evenly sized and orderly may be suspected as artificial. I always examine the entire hairstyle, looking for signs of wave or straightness. I look for signs in hairstyle components where curl would be irrelevant or counterproductive to the finished style, and I pay special attention to mismatches between one zone of the head and another. Artificial curls are arranged in strict rows or stacks, with a logic and consistency to their rotational direction, say clockwise on one side of the head and counterclockwise on the other. Natural curl tends to be chaotic and “frizzy”, there is usually a mix of different diameters of curl and they don’t always rotate in the same directions. Q: Were you already an accomplished stylist by then? A: Yes. I now have over 20 years professional hairdressing experience. I have also taught in an accredited beauty school and as a color educator for a major haircare company. Q: Did you have to do a lot of trial and error to figure out how certain hairstyles were achieved? A: Not really, once I realized they could be sewn together, the styles came together fairly quickly. Using high quality portrait examples is a must, though. Q: Which ones were the most challenging and why? A: The ones I do on mannikins are the hardest, because I have only my two hands to work with. A live model can follow directions or help out by holding on to a piece of equipment or hair. But in terms of sheer manual dexterity, the “beehive” (ca. 117 A.D.) is the toughest so far. Q: I was surprised by how much hard science — like the isometric tension keeping bodkins in place and the anatomical requirements of hair length for any given style — was in your JRA paper. Are these factors you can calculate by observation or did you have to learn them by experimenting? A: Hairdressers learn a lot of biology and anatomy during cosmetology training and we apply it every day in the salon. We all learn that certain hair lengths work better for certain styles. I prefer using vertebrae to measure hair length because it is precise but not dogmatic. I have used bodkins to dress my own hair and I use them to manage the long hair of clients. You become familiar with how they work and it just becomes a matter of finding ways to describe them. Q: How did you find those unpublished needles in the Johns Hopkins collection? A: The Johns Hopkins University has a very good archaeological collection and museum. Their gracious former curator, Eunice Maguire, helped me with the needles. There is a lot of unpublished material out there. Q: How was your “Julia Domna: Forensic Hairdressing” presentation received at the Archaeological Institute of America Conference this year? A: It seemed to create a a lot of buzz and people said they enjoyed it. It’s not every conference where you go to the poster session and see “heads on pikestaffs”! Q: Is there anyone else doing anything like what you do? A: Dr. Elizabeth Bartman (president of the AIA) and Prof. Katherine Schwab of Fairfield University have each employed hairdressers to recreate the hairstyle of Faustina the Elder and the ancient Greek Erechtheion caryatid hairstyles, respectively. But, so far as I know, I am the only professional hairdresser working as a scholar in her own right on the topic of ancient hairstyle recreation. Q: Do you have any specific goals, attitudes you’d like to change or new approaches you’d like to establish in the archaeological community? A: I would love it if all archaeological museums would display their sculptures out in the middle of the room instead of in niches and against walls! And I wish there were mirrors behind every small sculpture displayed in a case. Q: For instance, creating consistent terminology (i.e., bodkins and needles instead of curlers/hairpins/bobby pins) standards in the scholarly literature? A: That’s a great idea…and I would extend the concept to include technologically neutral descriptions of hair itself. Q: If you could choose one ancient hairstyle or technique to bring back into fashion today, which one would it be and why? A: Selfishly, I would love to see more women of every age wearing their hair as long as they can: that way I could find hair models more easily! Inspiring, isn’t she? 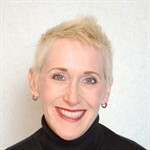 Not only is Janet Stephens an expert in her profession, but in just six years she taught herself to be an expert in the academic field of ancient hairdressing, maybe even the primary expert. Now run, don’t walk, to watch all of her videos and clamor for more. A silk on linen needlework sampler stitched by 12-year-old Mary Antrim in 1807 sold at Sotheby’s Important Americana sale in New York on Sunday for $1,070,500 (including buyer’s premium). That’s ten times more than its pre-sale estimate of $80,000-$120,000. Girls at that time (and from the 17th century through to the 20th) were taught needlework from a very young age, both in school and at home. They proved their skill, virtue and industry by creating samplers. Early samplers had a utilitarian aspect, teaching girls schoolwork as they stitched things like letters of the alphabet, maps and mathematical tables, but by the 18th century the focus had shifted to a more pictorial approach. 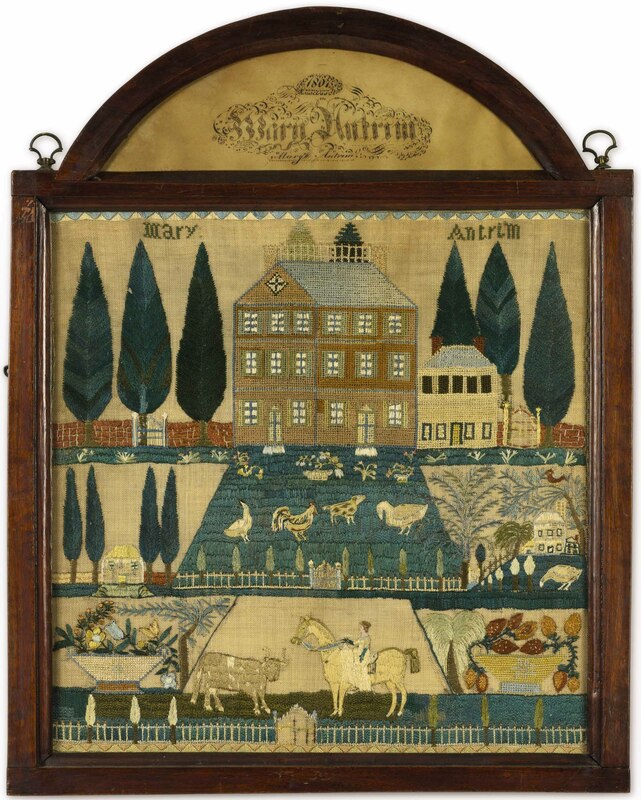 Mary’s elaborate design of farm life, featuring symmetrical vignettes of trees, animals, houses, fruit bowls and an elegant lady riding side-saddle is an exquisite example of pictorial needlework. She was the daughter of weaver John Antrim, so she came by her extraordinary skills honestly. The piece was one of 198 lots from the collection of needlework historian Betty Ring who wrote the definite reference books on the subject and pretty much single-handedly elevated the entire field of folk art needlework with her scholarship and her collecting. Sotheby’s has put her seminal books on the subject, Girlhood Embroidery Volume I, Volume II and American Needlework Treasures online. They are so rich with illustrations even just paging through them is a beautiful voyage of exploration. The sale of the Ring collection totaled $4,389,503, over a million dollars above the total estimates, which is particularly remarkable considering that a quarter of the lots didn’t sell at all. 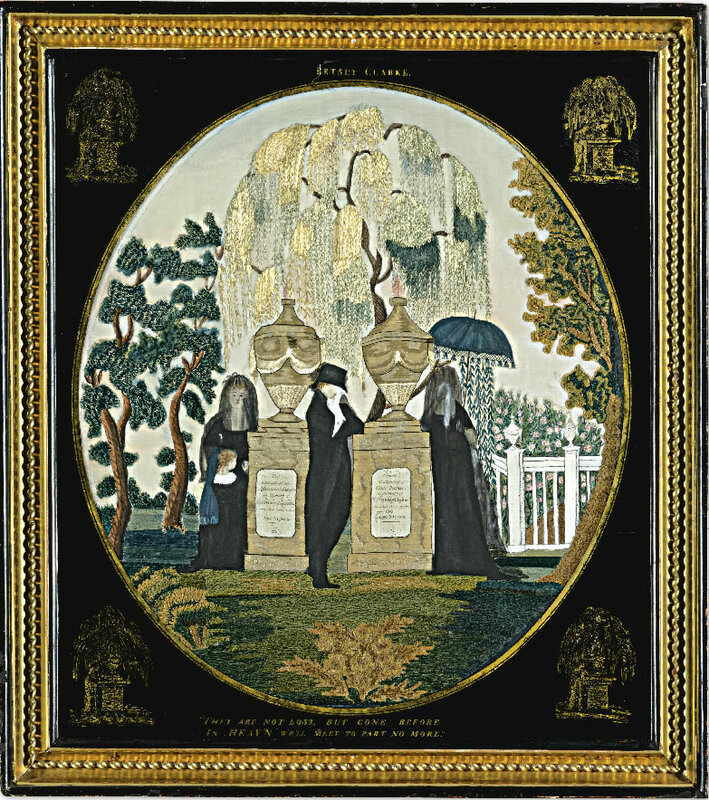 Most of the unsold pieces were memorial samplers, depicting veiled mourners, weeping willows and gravestones stitched in memory of a deceased loved one. Interestingly, when Girlhood Embroidery was first published in 1993, it was positively reviewed by The Wall Street Journal (to this day it’s the only book about American decorative arts ever reviewed by the WSJ) and that reviewer was creeped out by mourning pieces. His description of them as “eerily premonitory of Edward Gorey” is supposed to be negative, I suppose, but I think it’s a ringing endorsement. 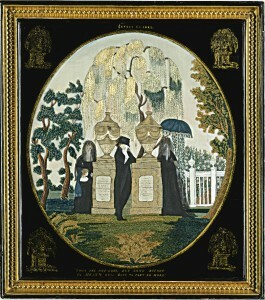 The one pictured on the right, embroidered and painted on silk by Betsey Clarke, at Miss Patten’s School, Hartford, CT, ca. 1809, is one of the ones that didn’t sell. I find it gloriously Gorey-esque. Sotheby’s press release declares the Mary Antrim sale established a new record sale price for a needlework sampler at auction. It’s not the greatest sale price ever garnered by a young woman’s embroidery, though, so either they made a mistake or they’re defining needlework sampler in a way I don’t understand. 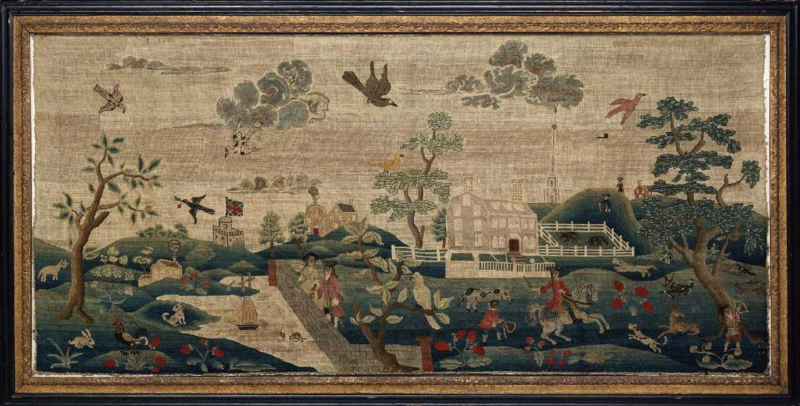 The most expensive sampler ever sold is View of Boston Common by Hannah Otis (1732-1801), stitched around 1750. It’s a huge piece, meant for display over a chimney mantelpiece, embroidered in wool and silk on linen canvas. It was purchased by the Museum of Fine Arts, Boston at Sotheby’s in 1996 for a record $1,157,500. Its historical subject matter drove the price. It captures the Boston Common during the colonial era, complete with British flag flying over the Block House (destroyed in 1761) on the left, the actual beacon on Beacon Hill, and in the middle the Thomas Hancock house with a wealthy young man on his horse accompanied by a black groom in front of it. Thomas Hancock was the father of John Hancock, he of massive signature fame. The young man on the horse could well be John Hancock himself, and the couple on the left his mother and father. Hannah Otis is closely linked to the American Revolution and American history in general. She was born in 1732, the daughter of Colonel James Otis and Mary Allyne Otis. Her mother was a descendant of Mayflower passenger Edward Doty. Her father was a judge and representative to the Massachusetts legislature. He was a fervent anti-royalist as was his son, James Otis, Jr., who introduced the phrase “Taxation without representation is tyranny” during the Stamp Act debates. Hannah’s older sister Mercy Otis Warren was a poet, playwright and historian who published numerous pro-Revolution writings and corresponded with the luminaries of the American Revolution like John Hancock, Thomas Jefferson, George Washington and John Adams. The sampler remained in the Otis family until the 1996 sale. It had been on loan at the Boston Museum of Fine Arts for over 40 years when the family decided reluctantly that they had to sell it. Oxford University professor and Voltaire scholar Nicholas Cronk has uncovered 14 previously unknown letters by Voltaire written during his almost-three-year exile in England. Professor Cronk, director of Oxford University’s Voltaire Foundation, found the letters while doing archival research in US libraries. Paul LeClerc, former president of the New York Public Library and a Voltaire scholar in his own right, asked Cronk to examine 11 letters by the French Enlightenment satirist they had recently purchased. Cronk found an additional two in the Morgan Library and Museum and one in the Columbia University library. These letters shed new light on Voltaire’s time in England, confirming that he did indeed receive an impressive £200 pension from Robert Walpole’s government, a fact long debated by scholars, and underscoring Voltaire’s remarkable success at climbing the British social and literary ladder in a short period of time. He had arrived in England in 1726 a penniless poet and playwright with a knack for irritating the monarchy and aristocracy of France with his biting satire. He didn’t speak a word of English, and all he had to smooth his way was a letter of recommendation from the British ambassador to Paris. He learned fluent English in six months and was corresponding with royalty before a year had passed. One letter is from Voltaire to Lord Bathurst, a patron of the arts who often hosted great English thinkers at his manor, Richings, including Alexander Pope who wrote much of his translation of Homer there. In this letter Voltaire thanks Bathurst for “the freedom of your house and the many liberties I enjoyed in that fine library.” “This shows us one way in which Voltaire would have been exposed to so much of Shakespeare, Newton, Locke, Swift, Pope and others – both by reading their books in the library at Richings and perhaps even by meeting contemporary English thinkers,” Professor Cronk explained. Shortly after his arrival, in June of 1727, King George I died and his son assumed the throne as King George II. This was a fortunate changing of the guard for Voltaire, because the new king’s wife Queen Caroline was a strong supporter of the arts with a particular love of poetry. Grabbing the social climbing bull by the horns, Voltaire published an English translation of La Henriade, his 1723 epic poem about French King Henri IV, dedicating it to Queen Caroline. The poem sold well and solidified his patronage at the highest levels of British society. Queen Caroline was a political ally of Sir Robert Walpole and may have played a part in securing Voltaire that £200 grant. One of the most notable of the newly discovered letters was written by Voltaire to the Treasury confirming receipt of the money. 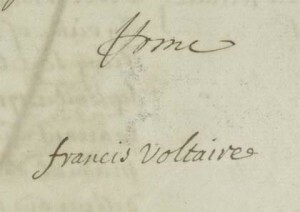 He signs it “Francis Voltaire,” a unique autograph that combines an anglicized version of his first name François with his famous pseudonym. His time in England introduced him to ideas that he would advocate for the rest of his life, including freedom of speech, religious tolerance and constitutional monarchy. After his return to France in 1729, he would praise those ideals in his Letters Concerning the English Nation, a collection of essays published first in English in 1733 and then in French a year later. The French publication caused a scandal, getting the publisher sent to the Bastille and forcing Voltaire to flee yet again. The 14 letters have been scanned, digitized and uploaded to Oxford’s Bodleian Library’s Electronic Enlightenment website, a treasure trove of correspondence from over 6,000 writers, philosophers, and political leaders from the 17th and 18th centuries. In collaboration with Oxford’s Voltaire Foundation, Electronic Enlightenment is working on digitizing the definitive complete collection of Voltaire’s writings. It’s subscription only, I’m sad to say, but if you have access to an institutional login, you can view the Voltaire letters here. 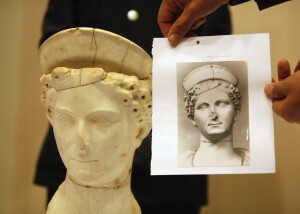 Italian Prime Minister Mario Monti is in Tripoli to sign a new treaty with the post-Gaddafi government, and he brought the head of a first century A.D. Roman sculpture with him to seal the deal. It turned up last year as lot #261 of the April 14 Antiques sale at Christie’s London. I will give you one guess as to the provenance they claimed on the piece. Oh yeah. It’s our old friend the Swiss private collection. They removed the lot from their website after they got busted, but this article quotes their original lot notes: “private collection, Switzerland, circa 1975; acquired by the present owner in Switzerland in 1988.” It was still attached to its body in a Libyan museum in 1988. Such a blatant lie. London-based Libyan archaeologist Hafed Walda saw the lot before the auction and alerted Christie’s that it was the Domitilla head stolen from the Sabratha Museum. They ignored him and sold it to an Italian buyer for £91,250 ($142,000). Archaeologist and brilliant blogger Dorothy King also tried to get Christie’s attention but they blew her off too. 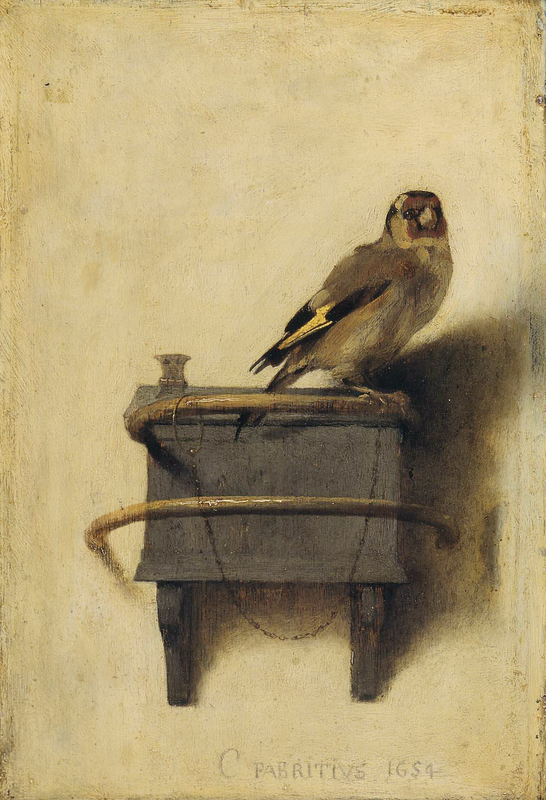 My experience of Christie’s is that that’s par for the course, but just in case … I knew they couldn’t give me the buyer’s details, so I asked the head of department, Ms Georgina Aitken, to pass mine on to the buyer as I had some information about the history of the piece. Ms Aitken said she would not do so unless I told her what the information was. I briefly explained that there was evidence to suggest that the head might have been looted and that the provenance was faked, and that Christie’s were aware of this and did nothing. There are more chances of pigs flying than of this information being passed on to the buyer. See how weaselly that “additional information” bit is? Because Hafed Walda told them where that head really came from before the auction so they couldn’t say they had no idea they were selling stolen goods again. No, they just got additional info long after the fact, you see, that really clinched it for them. Please. Anyway they just reimbursed the buyer and that’s the end of that. No consequences. This is why they keep selling artifacts from “Swiss private collections” over and over again, even when there’s hard evidence that they were stolen. To close on a less enraging note, here’s a fun fact about Flavia Domitilla Minor: she died at just 21 years old three years before her father Vespasian became emperor in 69 A.D. Twelve years after that, her younger brother Domitian became emperor. He deified her and granted her the title of Augusta. Her daughter Flavia Domitilla converted to Judaism/Christianity (the Talmud claims the former, Eusebius the latter) and was exiled to the island of Pandataria by her uncle Domitian for her “atheism” which included a refusal to worship her own mother along with the rest of the imperial family and traditional Roman pantheon. She is now a Christian saint and her former property is the exquisite catacomb of Santa Domitilla. 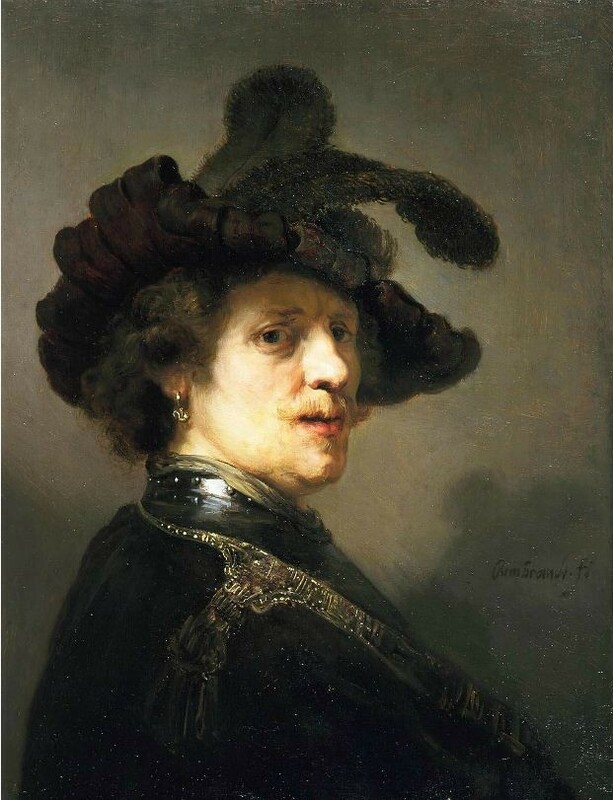 On January 3rd, two vicious brutes broke into a retired vicar’s house in County Armagh, Northern Ireland, beat him up and tied him to a chair, then stole the most valuable pieces from his collection of paintings and antique furniture as selected by a knowledgeable accomplice via iPhone. Before leaving they destroyed the rest of the art and antiques with a hatchet. 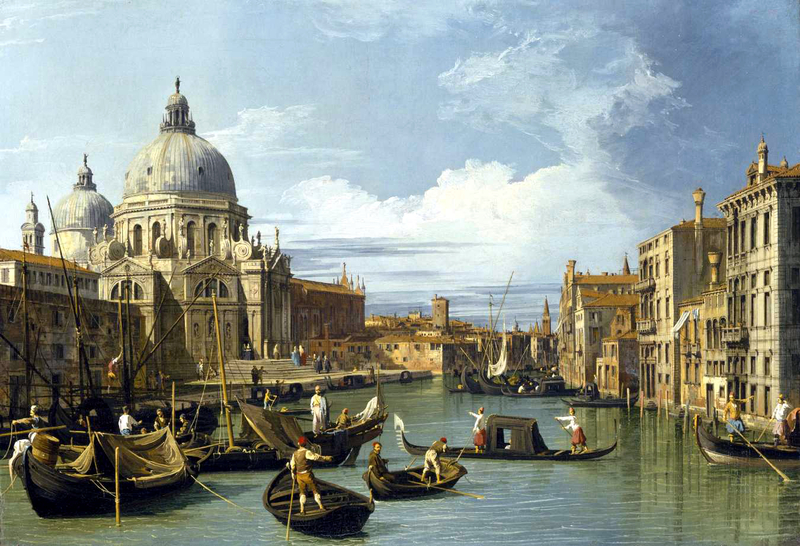 Authorities are keeping mum on the details while the investigation is ongoing — the vicar’s name is not being released because he is terrified of drawing attention to himself — but we know that among the stolen pieces are paintings by 18th-century Venetian master Canaletto. The total value of the stolen works is well into the millions of dollars. No word on what the rest of the vicar’s collection was worth before they took a hatchet to it, but he’s been an avid collector and a fixture at auctions for decades. The Irish Daily Mirror understands the two men worked with a third party to assist them with the robbery. A source said: “They were on the phone to someone outside the house and from what I understand they used a hi-tech phone to show the third party which pieces were in the house. They wanted to know which were most valuable because those are the ones that were stolen. There was a lot taken, an awful lot. The thieves also stole the victim’s contact books which had personal information about a number of other high end art collectors, including scions of the Guinness family and Edward Haughey, Baron Ballyedmond, the richest man in Northern Ireland. All the people in the book have been alerted to the theft and advised to increase their security. Two similar thefts took place in the same county two years ago. The Police Service of Northern Ireland and Ireland’s national police force, An Garda Siochana, are investigating any connection between the crimes.